Criticising the judges - still a taboo? Freedom of expression and the free flow of information, including free and open debate regarding matters of public interest, even when this involves criticisms of individuals, are of crucial importance in any democratic society. They are key to personal development, dignity and fulfilment of every individual, as well as for the progress and welfare of society, and the enjoyment and other human rights and fundamental freedoms. Freedom of expression is not, however, absolute. Every system of international and domestic rights recognises a carefully drawn series of restrictions on freedom of expression, taking into account the overreaching values of individual dignity and democracy. Such restrictions include, for example, prevention of obscenity and racial and ethnic hatred, and the protection of personal reputation and public safety. Article 29 of the Universal declaration of Human Rights provides: In the exercise of his rights and freedoms, everyone shall be subject only to such limitations as are determined by law solely for the purpose of securing due recognition and respect for the rights and freedoms of others and of meeting the just requirements of morality, public order and the general welfare in a democratic society. A more precise legal standard is articulated in Article 19(3) of the ICCPR. Under that article, restrictions on freedom of expression may only be legitimate if they are "provided by law and are necessary: (a) For the respect of the rights and reputations of others; (b) For the protection of national security or of public order (ordre public), or of public health or morals". The interference must be prescribed by law. This implies that the law is accessible and "formulated with sufficient precision to enable the citizen to regulate his conduct." Second, the interference must pursue one of the legitimate aims listed in Article 19(3). Third the interference must be necessary. This implies that it serves a pressing social need, that the reasons given to justify it are relevant and sufficient and that the interference is proportionate to the legitimate aim pursued. This is a strict test; present a high standard which any interference must overcome. Unfortunately, judiciary, the ultimate guarantor of rights, often falls short in overcoming this test when it comes to offences related to contempt of court. The offence of contempt of court continues to be used by the courts across the world to gag offensive critique. Even in England, where the last successful prosecution for scandalising the court was brought in 1931, as David Pannick asserts, "there can be little doubt the bringing of such prosecutions had an inhibiting effect on newspaper and magazine reporting of judicial affairs generally…[t]he continued existence of the offence, and the memory of successful prosecutions, inhibits journalists, who wrongly suspect that they have a legal obligation to speak respectfully and cautiously when discussing the judiciary." The power to punish for contempt of court is the mechanism by which the judiciary protects itself from publications that might unduly the result of litigation. The laws of contempt are primarily designed to balance the freedom of expression with the judiciary's attempt to maintain its authority and safeguard public order. Broadly speaking, contempt of court is of three kinds: I) violation of an order of a court, II) interference in the judicial process and III) criticism of a judge, his judgement, or the institution of the judiciary. It is this last category, also known as scandalising the court, continues to be used by the courts across the world to muzzle offensive critique. The courts of law, the ultimate guarantor of free expression, have found it difficult to come to terms with free speech critically directed at the courts themselves. Lord Russell CJ defined the 'offence of contempt of court' as "any act done or writing published calculated to bring a court or a judge of the Court into contempt, or to lower his authority." However, Lord Russell explained "that description of that class of contempt [scandalising the court] is to be taken subject to one and an important qualification. Judges and Courts are alike open to criticism, and if reasonable argument or expostulation is offered against any judicial act as contrary to law or the public good, no court could or would treat that as contempt of Court." As eloquently pronounced by Lord Atkin, "Justice is not a cloistered virtue: she must be allowed to suffer the scrutiny and the respectful even though outspoken comments of ordinary men." 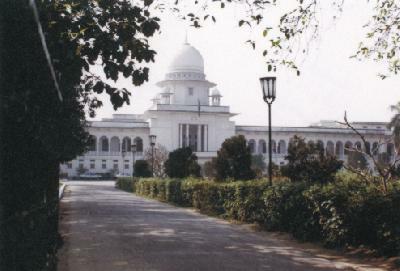 Contempt in the face of the court, which is directed at the judiciary or other personnel and constitutes behaviour other than speech, or speech that has crossed over into overt acts would mostly fall outside the reach of any ordinary doctrine of free speech, irrespective of any other protection to which it may be entitled. This point merits emphasis because the distinction must be drawn between contempt involving and not involving free speech considerations is often blurred. To recognise and evaluate the problem inherent in a system of legal free speech, a strict and almost hermetic distinction must be maintained between speech (whether conveyed by mouth, in writing, or by technological means) and overt action. The rationale behind the contempt law is an abiding British fear of 'trial by newspaper' of the sort that often disfigures major trials in America, where the First Amendment permits the press to comment directly on matters involved in litigation. In most of the jurisdictions, contempt of court appears to be a strange element of law, which is both unclear and anomalous. It is often said that there is a distinction between 'civil' contempt and 'criminal' contempt, although no one appears able to state the distinction precisely and it is conceded generally that the distinction is of little practical significance. The law of contempt, or the law relating to interference with the administration of justice, seeks to strike a balance between the competing values of a fair trial and freedom of expression. Many informed persons think that the present law of contempt unduly restricts freedom of expression. Opinions in a democratic society will inevitably differ as to where should be drawn the line which makes the communication of information, ideas and opinions a criminal offence. But that a line exists is not open to doubt. Abul Hasnat is a rights and governance specialist.